So my friend Melissa and her former roomate (Jesca) had a fundraiser dinner and dance on saturday night. It was so amazing to see people come together to raise money and support for 12 orphans in Uganda, Africa to feed and cloth them and send them to school. 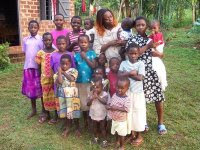 Melissa's roomate (Jesca) is from an area in Uganda called "Mukono" and her sister lives there- and her sister is a nurse who has taken these kids and fed and clothed them herself with the little that she has. Jesca went to visit her and saw this and told Melissa about it: in response to this Melissa said "how can we not do anything about this?" and from there the idea came alivefor the people of Chilliwack, Abbotsford----basically the Fraser Valley and the West coast (and even beyond) to respond by sharing our money and resources to see these kids, and future kids taken care of. The idea is to get the people in the village to be the ones to help build the orphanage (once we get 10,000 dollars- over 10 % of that was raised on saturday night alone!!). The plan is to set the local people up with a garden so they can grown their own food, and have chickens (and a chicken coop) so they can sell eggs to support themselves. The plan is to ensure these orphans, many of whose parents have died of AIDS ( a huge epidemic in Africa right now), the material things they need and a roof over their head, and education so they can be raised up to be successful and make their own impact in their community! The neat thing about the dinnner and dance was how everyone rallied to support this cause; Melissa's dad's band played (they were awesome! ), Jesca's family provided food for everyone (Ugandian food- yummy..) and both of their friends donated their services for the silent auction. Photographers taking pictures and offering portraits, drum lessons donated, handmade jewellry from Uganda, ect. Another neat thing was when I left I ran into a couple of girls in the parking lot asking about what band was playing and what venue it was. I explained it to them and they got so excited because their church is doing something similar for an orphanage in Africa! So I invited them in and introduced them to Jesca and they got business cards. There is a website but I don't know what it's called yet. So for now there is an e-mail: mukonohome@hotmail.com and look on facebook for future events. If we had 9 more events like that we could have enough for the people of the village to build the orphanage!!!! After the dinner- I had this sense that somehow I was making a difference in someone else's life, and I truly believe that we as people put in the work and effort and God will mutiply it and bless it! God loves children!